Research In Motion (RIM) has said it is investigating the reason why email services were disrupted for millions of BlackBerry owners in Europe, Africa and the Middle East, due to a crash that allegedly originated from a RIM data centre in Slough. Although emailing services do appear to be back to normal, the company has warned that Internet browsing and instant messaging services such as BBM may continue to run slower than usual until the problem is resolved entirely. When the disruption broke yesterday afternoon (10th October), the company released the following statement: “Our technical teams are working to return services to normal operation as quickly as possible. 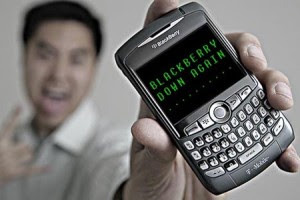 Although many personal mobile users were affected by the outage, it’s believed that the inconvenience to corporate phone owners is restricted, owing to the fact that BlackBerry has two separate servers for consumers and businesses. The bad news is the latest in a string of negative press for RIM, with the media continually reporting on how the company’s BlackBerry brand is losing market share to rivals such as HTC and the Apple iPhone, which is beginning to develop ties with corporate clients owing to strengthened security for business email that rivals the encryption standards, which made BlackBerry a favoured brand in the first place.